Believe it or not, lighting can have an enormous impact on workplace productivity. Bad lighting, in particular, has been known to create a negative mood in the office; flickering or broken lights are a common complaint amongst employees. With that in mind, it’s important to prioritise good lighting when putting together your office design. By far the best way to ensure that your office is well-lit is by allowing for adequate natural light. Large windows and skylights will brighten up your space and create a sense of calm. However, if you’re not building your own offices or looking for some to rent, natural light may be something you’re not able to change. 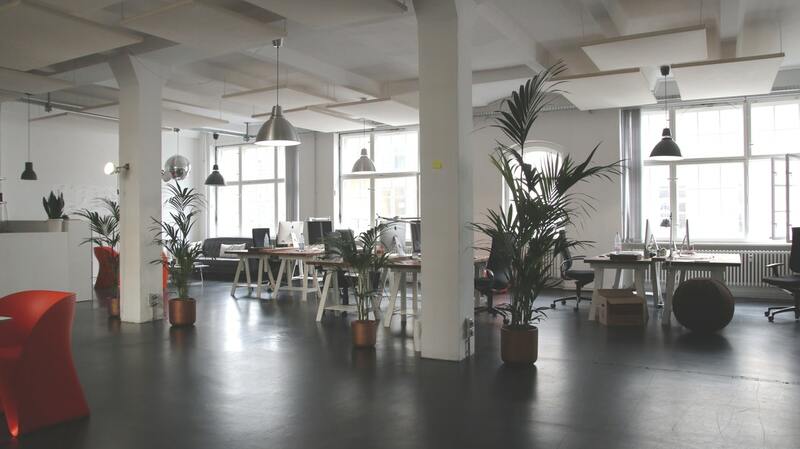 If this is the case, below are a few artificial lighting options that can help to create a productive atmosphere in your office. More often than not, overhead lighting means glaring fluorescent lights that are prone to flickering. These can be enormously distracting and offer a harsh light that can sometimes make computer screens harder to focus on. However, this needn’t be your only option. Pendant lamps and spotlights offer a modern alternative to strip-lighting that can play a part in the overall design of your office space; the example below shows how oversized metal pendant lights complement the open-plan studio design. The main benefits of overhead lighting are that it can brighten up an entire office with relatively few lights. While overhead lighting works well in the summer months, when the days are naturally brighter, it can become glaring in the winter months. Wall lighting is an ideal alternative to overhead lighting, as it offers a similar amount of brightness, but with a softer feel. The softness of indirect lighting (ie. lighting that is reflected on the ceiling and/or walls as opposed to directly onto desks) is also thought to increase our perception of comfort. This, in turn, can improve productivity. What’s more, wall lighting is a great way to add stylish features to your office design, while remaining entirely practical. In recent years, we have seen a boom in flexible working; employers no longer feel the need to restrict staff to 9-5 work hours, often allowing them to rearrange their hours to better suit their schedules. With this new shift, some employees have begun to work later into the evenings – and this calls for a different kind of lighting altogether. When working late, desk lamps or floor lamps are preferable to overhead or wall lights. Both of these will allow employees to turn on their personal lighting, as opposed to lighting up the entire office. Not only does this save on electricity bills, it can also feel much more comfortable, which leads to increased productivity. We offer a range of stylish floor and desk lights, including the LED Cubert Desk Light, which has built in charging ports for your laptop and mobile phone. Another important factor to remember when it comes to an office environment is the furniture that you have. If you have a lot of dark furniture in a space that doesn't recieve much natural light, then you will inevitably make the room seem darker. By opting for white furniture you can actually make your office space feel much brighter than it actually is. This is also true for the other furniture such as chairs and even down to things such as the colour of the paint on the walls. If you are thinking about buying new office furniture then you should take a look at the range that we have on offer. We provide a wide range of furniture to suit all of your needs. Take a look at our range online today.